This paperback edition was formerly published in hardback under the title Fight. 'Life-changing. One of the best books I've ever read!' - Dr Michelle Braude, author of The Food Effect DietWhenever elite fighter Hazel Gale entered the ring, she felt fear. Not just the rational fear of being knocked out. But something deeper as well. The fear that she didn't deserve success, and that she would let everyone - especially herself - down. While others saw a confident world champion athlete, Hazel was plagued by anxiety, self-doubt and depression. It was these things - the monsters of her mind - that she felt were her most dangerous opponents, and she waged a war. It was that hard-fought internal battle that ultimately led her to burn out. Now a sought-after London therapist, Hazel has created a revolutionary system for overcoming fear, underperformance and self-sabotage. 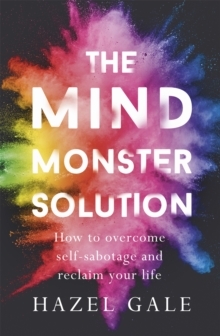 In The Mind Monster Solution, she uses personal anecdotes, practical exercises and innovative therapeutic tools to help you create a balanced life, rich with meaning, confidence and positivity. Written with humility and humour, this book will help you emerge victorious from your own battles, whatever they may be. You'll learn how to defeat those inner monsters and let go of limitations, to reach your true potential and live a happier, more fulfilling life.